Rogers and out reports on the day promotion became impossible. Tough day to write about but there is a positive end to the report. Roll on 2019. It took Kent 75 minutes to get the 52 runs required to take an important victory in their search for promotion at Lord's today, consigning us to another season in division two next year. Ethan Bamber and James Fuller did their best, taking three wickets between them today, but we were around fifty runs light in our second innings and Sam Billings' professional knock saw our visitors home. I had initially planned to watch the Second XI play at Billericay today, but there seemed to be little chance of much play. Essex were thirteen runs behind us with three wickets in hand, and indeed, we quickly won by ten wickets. 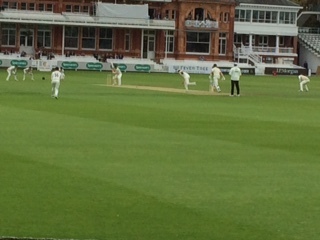 So I opted for Lord's in the remote hope that we might bring off another surprise victory. I arrived just after Ethan dismissed Bell-Drummond leg before from the fifth ball of the day, with the score on 106/5. Ethan bowled tidily but sadly the same could not be said for Steven Finn. Keeping the run rate down is certainly not his forte, and although he did produce a couple of venomous short deliveries, he was guilty of over pitching and Kent, captain Billings in particular, made him pay by reaching the boundary too often in the short run chase. After three unsuccessful overs - his figures were 7-0-39-1 - JK Fuller replaced him from the Pavilion end and immediately caused Kuhn to play and miss his first two deliveries. Admittedly, he did plunder six runs from two balls later in the same over, but JK trapped him leg before in his next over, leaving Kent 136/6 with twenty runs needed. Wily campaigner Darren Stevens was next man in and looked to steer Kent to their target with Billings. JK gave us a glimmer of hope with another LBW decision, this time against Stevens - 144/7 with twelve to get. Harry Podmore was next at the crease and if we were to have any chance at all, we needed to get him on strike as Billings was looking very comfortable. Our last throw of the dice, saw Martin Andersson replace Bamber at the Nursery end. Unfortunately, his first ball saw Ethan fumble a return from the boundary, meaning Billings took two runs and kept the strike. He never relinquished it, and an edged boundary off JK, that Andersson very nearly stopped, trickled agonisingly against the rope, leaving Kent winners by three wickets. With Sussex struggling at Durham, Kent look favourites with Warwickshire to reach the top tier and deservedly so, from what I have seen of them this season. From our point of view, the 'unthinkable' has happened and we shall be playing second division cricket in 2019. Too many players have under-performed this term in all formats, and it has been left to the likes of Tim Murtagh and Jimmy Harris to keep us afloat in the ultimately unsuccessful quest for promotion, plus an honourable mention for Paul Stirling's white ball batting with four centuries. However, the biggest plus for me has been the introduction of several young players this season who have acquitted themselves with credit. Max Holden, Robbie White, Ethan Bamber and Martin Andersson are great propects and I look forward to watching them in Middlesex colours for many years to come. Edited 3 time(s). Last edit at 2018:09:13:11:39:02 by BarmierKev.